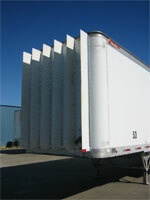 The Cross-Flow Vortex Traps create a series of trapped vortices, oriented vertically on the front face of the trailer. 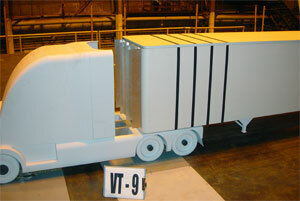 The trapped vortices decrease the pressures acting on the front face of the trailer and reduce drag. This technology has undergone extensive road testing. Fuel savings of between 4 to 5 percent were demonstrated in the wind tunnel and road tests of this technology. For an in-depth analysis of the road tests of this technology download the SAE technical paper (628kb pdf). If you are interested in licensing this invention please contact us. Read the press release here.